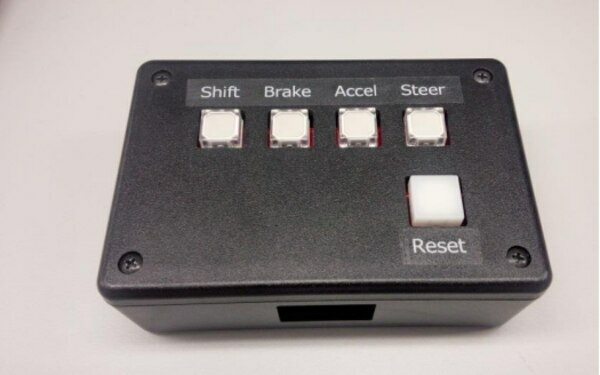 RoboCar MiniVan controls running, turning and stopping, control of vehicle speed, steering angle, mileage, various vehicle information of a mileage vehicle, control via a control device (ADC: Autonomous Driving Controller) independently developed by ZMP to CAN bus and analog wiring It is possible to do the acquisition. In vehicle control, the ADC electrically intervenes between the ECUs from sensors such as accelerator, brake, steering, etc. and inputs signals equivalent to the operation signals to control the vehicle. Vehicle information output from various in-vehicle sensors to the CAN bus via the ECU can be acquired from the user terminal by the ADC intervening on the CAN bus. The following vehicle CAN information can be acquired by ADC. For the brake depression amount, turn signal condition etc, you can obtain the control value from ADC. During traveling in Program mode, steering control is performed, when steering wheel is operated, and drive control is switched from Program mode to Manual mode,when accelerator / brake pedal is operated, respectively, it has "override function". With this function, by operating the steering wheel and brake when feeling danger during the experiment, it will be possible to secure safety from the control by the external device to the driver control. As for the mode of RoboCar MiniVan, an indicator box is installed in the car, and when the accelerator, brake, steering, and shift are in program mode, they are lit. By pressing buttons, you can also change each from program mode to manual mode. RoboCar MiniVan is a control system for moving forward and backward from "RUNNING" and "STOP" from the standard RoboCar PC or user exclusive device, so that you can control by accelerator and brake in the following two ways. A target value of the traveling speed of the vehicle is input as an input value.Control to the target value is independently set by the ZMP inside the ADC, and the control gain can be changed by parameter setting. As the user only inputs the target speed, it is easy to handle mode. Enter the accelerator and brake depression amount (strength) as input value.The control program to the target value can be built independently by the user himself, and RoboCar MiniVan transmits the control amount of the accelerator and the brake directly to the vehicle via the ADC. 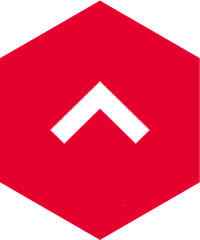 This mode allows the user to define the control logic for reaching the target speed finely. Or you can control the position (angle) of the steering that performs "bend" operation from the user exclusive device. As a method, you can select control by the following two methods. Each of the two control modes will be explained below. The control to the target value is done by PID control (*), and the control gain can be changed by parameter setting. The range can be entered from the right rotation 666 degrees to the left rotation 666 degrees at the angle of the steering wheel. Control image by RoboCar MiniVan's "Angle mode"
The steering torque amount indication is reflected at the moment when the command command is received, and the range is given from the -4096 (right rotation) to 4096 (left rotation) to the EPS motor as the output of the torque sensor. 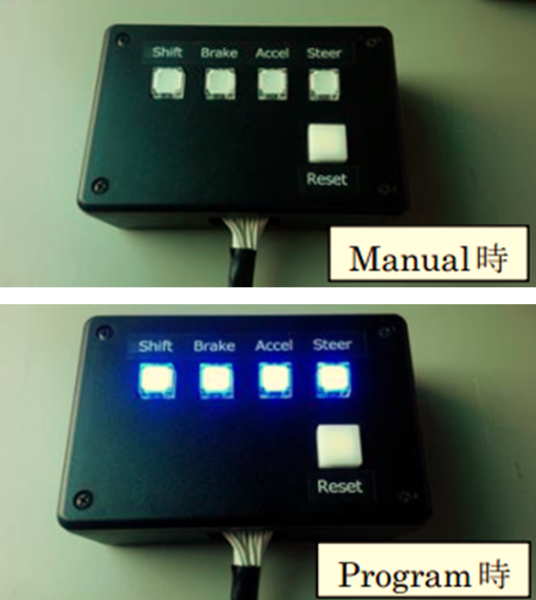 Control image by RoboCar MiniVan's "Torque (Torque) mode"
As a lighting device of RoboCar MiniVan, the following can be controlled from the RoboCar PC or user exclusive device. RoboCar MiniVan has the following safety functions. The ABS (Anti-lock Braking System) function, the air bag function, other warning indication etc. which are provided in the base vehicle are maintained as it is in RoboCar MiniVan. When the following events occur during operation in program mode, it forcibly shifts to manual mode and is handed over to driver's operation. When you press the emergency stop button, the speed command value zero is input and the vehicle stops. RoboCar MiniVan has such a function that various parameters can be set as config. You can change the control parameters, override thresholds, command value limits, etc. by rewriting the configuration as necessary, such as changes in the running environment. 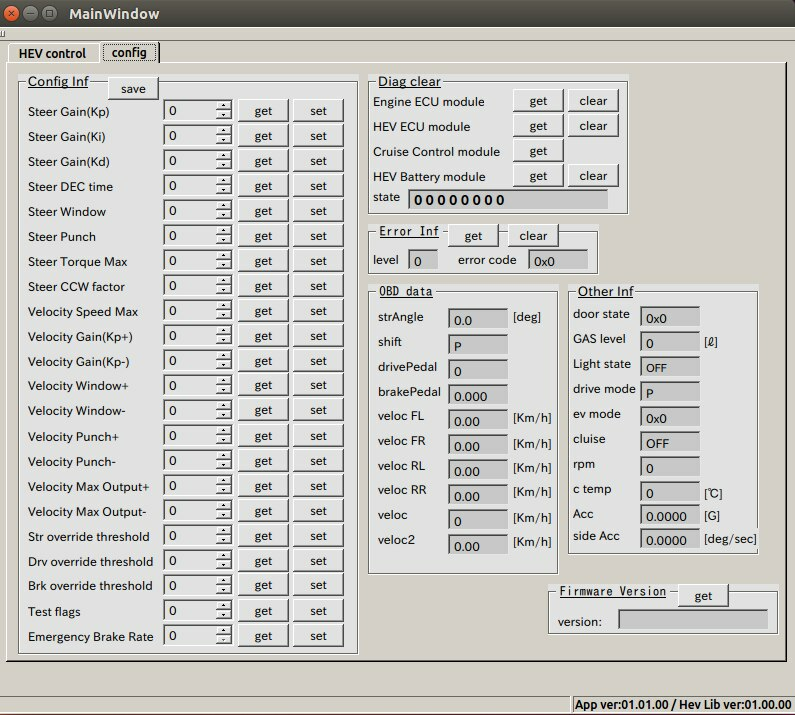 In RoboCar PC, a GUI is also provided so that you can easily configure config. Linux is running on the Control PC, and the user application operates as one process of Linux. We provide communication libraries for controlling RoboCar MiniVan and acquiring information. For API details API reference is included in the body set.